More than 160,000 people visit San Diego every year for Comic-Con International. The four-day convention has grown to be the largest of its kind in the world, with a 460,000 square foot exhibit hall and more than 700 events, including workshops, panels, film screenings and competitions. The week of Comic-Con is typically one of the busiest weeks on the Amtrak Pacific Surfliner, as fans of comic books and pop culture, industry professionals and even cosplayers fill the trains to and from the convention. Last year, more than 47,000 passengers chose to ride with us! This year, the convention falls on the same weekend as the start of the summer racing season at the Del Mar Thoroughbred Club, so trains will be even busier between Los Angeles and Solana Beach (a few stops north of the downtown San Diego Station) from July 18 to 22, 2018. To help accommodate the surge in travelers between July 18 and 22, 2018, Amtrak will add extra Pacific Surfliner trains between Los Angeles and San Diego. Train 568 departs Los Angeles at 8:50 a.m. on July 18, 19 and 20, 2018, making all Amtrak stops to San Diego, arriving at 12:46 p.m. Train 1568 departs Los Angeles at 10:00 a.m. on July 21 and 22, 2018, making all Amtrak stops to San Diego, arriving at 1:16 p.m. Train 593 departs San Diego at 8:02 p.m. on July 18, 19, 20, 21 and 22, 2018, making all Amtrak stops to Los Angeles, arriving at 11:04 p.m.
Download special train schedules or view all Pacific Surfliner train schedules. Extra seating is being added to select trains to increase capacity, but peak trains will still be extremely crowded between Los Angeles and San Diego. The table below shows the trains that we expect will be busier than others. Due to the nature of Unreserved Seating, this information is an estimate based on on projections, and is subject to change. View schedules for all trains here. Note: Information above as of July 21, 2018. Note: The Rail 2 Rail program with Metrolink and the North County Transit District will be suspended between Wednesday, July 18 and Sunday, July 22, 2018. Metrolink and COASTER passes will not be accepted on Pacific Surfliner trains during this period. Consider upgrading to Business Class if tickets are still available to have a guaranteed seat and other perks, such as a fully refundable ticket if canceled prior to departure, bonus points for Amtrak Guest Rewards members; complimentary beverages and light snacks; and more. If the train you were planning to take is full, consider taking an earlier or later train without having to make any changes to your Unreserved Coach ticket. There is service almost hourly between Los Angeles and San Diego, providing many options. We share updates on Twitter about which trains we expect will be busy. Our Twitter account (@PacSurfliners) is a great resource for service information. We share details about delays, which trains we expect will be busy, tips and more. Give yourself plenty of time to park, gather your belongings, and make your way to the station platform. For southbound trains, Business Class is located at the front of the train. If you are traveling from a station with luggage service, you can check your bags instead of carrying them onboard. Stations are marked on the schedule with a suitcase. 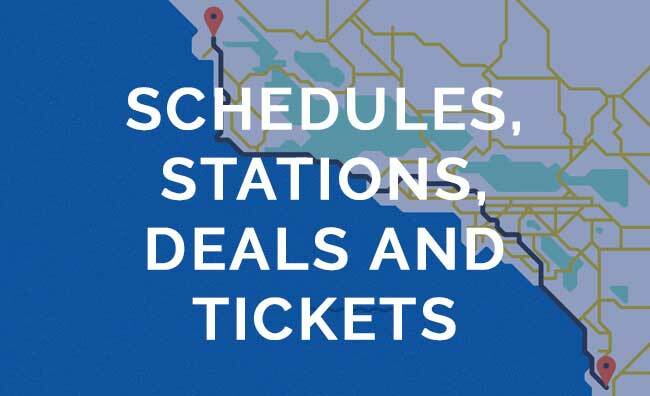 It’s best to book your tickets in advance at PacificSurfliner.com, 1-800-USA-Rail, or the Amtrak app. The “better option” listed about was horrendous. Standing room only. I was fortunate enough to find a step to sit on between Oceanside and Anaheim. Based on the number of (drunk) Angels fans that exited the train in Anaheim, your organization vastly underestimated the impact of the Redsox vs Angels game. This only compounded the Comicon issues. This isn’t absolutely unacceptable treatment of your passengers. I paid for my ticket on line a month in advance. There was. I warning at that time of these issues but I guarantee that the game and Comicon and the races were known about at that time. I used to enjoy this trip and found it to be a great way of avoiding freeway traffic. Not anymore. It will be a long while before I attempt this again. What a waste of a day. Hi Lisa, we apologize for the unpleasant conditions during your trip. Please know that the week of Comic-Con is one of our busiest of the year, and we added extra service and capacity using all available equipment. We take special events such as baseball games and the horse races into account when planning out which trains should have the extra equipment. The information provided in this article was based on ticket sales and historical data, however, due to the nature of unreserved tickets, riders were able to take earlier or later trains, which could explain why your train was so much busier than expected. Again, we apologize that you did not enjoy your time on the train. Please feel welcome to contact Amtrak with more information and request compensation.